SHORT OF NEWSPAPERS, Venezuelans are getting updates about their country’s deadly political crisis live – acted out by reporters on the bus to work. Maria Gabriela Fernandez and Dereck Blanco stand on board inside a black frame. “El Bus TV,” reads a sign over their heads. It’s less comfortable than a TV studio – they have to hold onto the rail with one hand to stop themselves from falling when the dilapidated bus brakes. But it’s one way of escaping government censorship. “The idea came from the need to break away from the news circus in this country,” the group’s creative editor Claudia Lizardo told AFP. To bring people truthful news through a mass transport system: the bus. In three minutes, Fernandez and Blanco deliver news on health, safety, sports, entertainment and, naturally, economics and politics in a country stricken by food shortages and deadly riots. Clashes at daily protests by demonstrators calling for President Nicolas Maduro to quit have left 66 people dead since 1 April, prosecutors say. Police fire tear gas and water cannons at protesters who hurl rocks and petrol bombs. The Bus TV team digs out original angles to bring home the drama of the protests, which are not broadcast on state television. “Each tear gas canister costs $40. At the black market exchange rate, that is 200,000 bolivars, or a whole month’s salary,” Blanco tells the audience of passengers. Economic news now: a kilo of chicken wings costs 9,700 bolivars. A Venezuelan on a minimum wage must work a day and a half to buy it. Blanco is a presenter on a national television channel but also does Bus TV out of frustration at being under official “pressure” not to cover certain subjects on air. 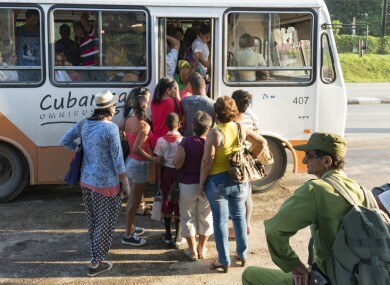 The team hop on and off buses around Caracas, with the permission of the drivers who often let them on without paying a fare. Bus TV is spreading, says Laura Castillo, the show’s producer. There is a team working in the western industrial city of Valencia and another in Puerto La Cruz in the east. “It is a marvelous idea. I like it when things are said clearly, without aggression,” said passenger Glenda Guerrero, a 68-year-old housewife. The six-member Bus TV group of journalists and performing artists started its shows on May 28 – the 10th anniversary of a dark day for Venezuela’s independent media. On that day in 2007, Maduro’s late predecessor Hugo Chavez shut down the country’s oldest broadcaster, Radio Caracas Television, for its critical coverage of him. Like Chavez before him, Maduro – himself a former bus driver – accuses the private media of being part of a capitalist conspiracy against his socialist leadership. The Venezuelan media rights group Espacio Publico and the National Journalists’ Union accuse the government of censoring media that carry coverage critical of it. The government took the Spanish-language edition of CNN television news off air this year. The groups say scores of newspapers have shut down because the authorities are denying them paper to print on. The country’s leading newspaper El Nacional and prominent news website La Patilla have been sued. Others have been bought up by businesses loyal to the government, Espacio Publico says. “The government has won the arm-wrestle over controlling the media,” says Castillo. Media rights group Reporters Without Borders ranks Venezuela a dismal 137th out of 180 countries for press freedom. The journalists’ union has counted more than 200 attacks against reporters during the past two and a half months of protests. Maduro has fanned the protests by proposing to reform the constitution, “without consulting Venezuelans in a referendum,” Blanco and Fernandez report, wrapping up their bulletin. Passengers applaud as the presenters sign off. Meanwhile, the bakeries still have no bread. Thank you for watching, this is Bus TV. Email “Facing a newspaper shortage, Venezuelans are acting out the news on buses”. Feedback on “Facing a newspaper shortage, Venezuelans are acting out the news on buses”.